Why I study what I study: I grew up in the Piedmont of North Carolina and it was there that I developed an interest in the environment and wildlife exploring the woods in my backyard. I continued to pursue my interest in the environment and went to study Wildlife and Fisheries at Colorado State University in Fort Collins, CO. In Colorado, I was fascinated by not only its famous mountains but also the prairies of eastern Colorado. While working on the shortgrass steppe, I developed a strong interest in plant community ecology. After working on the SGS-LTER crew for 6 years, I decided to pursue a Masters degree in Botany at the University of Wyoming in Laramie, Wyoming. After my Masters work, I accepted a PhD position with the Mayfield Community Ecology Lab at the University of Queensland in Brisbane, Australia. It was a long and sinuous road to where I am today but along the way I found many interests, skills, colleagues, and friends. Thesis: The leading edge of the big sagebrush distribution: Characterization of the structure and dynamics of the big sagebrush plant communities in northeastern Montana, USA. In general, I am interested in plant community and quantitative ecology. I particularly enjoy studying semi-arid ecosystems, I am currently studying semi-arid woodlands in Western Australia and have previously worked in semi-arid shortgrass steppe and sagebrush steppe plant communities in the western United States. My current research build on previous research on annual plant communities in Western Australia’s York Gum woodlands. My research will pair field studies and ecological modelling to understand species coexistence and plant community assembly in annual plant communities. Specifically, I am working to understand the role of higher order interactions in species coexistence. My research will use data I collect in the field as well as from previous studies by the Mayfield and Dwyer Labs in these systems. Combining this empirical data with statistical models developed through collaboration with the Stouffer Lab at the University of Canterbury (Christchurch, New Zealand), my research will add to current knowledge of higher order interactions in plant species coexistence. Figure 1. From Mayfield and Stouffer (2017) Nature Ecology & Evolution. Check out more research from the Mayfield Lab at The University of Queensland. Check out more research from the Dwyer Lab at The University of Queensland. Check out more research from the Stouffer Lab at The University of Canterbury. Figure 1. Modified from Schlaepfer et al. (2015) Ecosphere. Building my Master's research at the University of Wyoming with the Burke/Lauenroth Lab, I am exploring impacts of climate change on big sagebrush (Artemisia tridentata) plant communities in the western United States. My thesis characterized existing plant communities adjacent to areas of predicted increasing suitability (blue, Figure 1). Using field data, I parameterize a paired soil water and individual plant growth model to simulate plant community growth under current and predicted climate. This model "grows" individuals of selected plant species and/or functional types based on a number of user specified inputs such as rooting depth, soil texture, and germination probability. 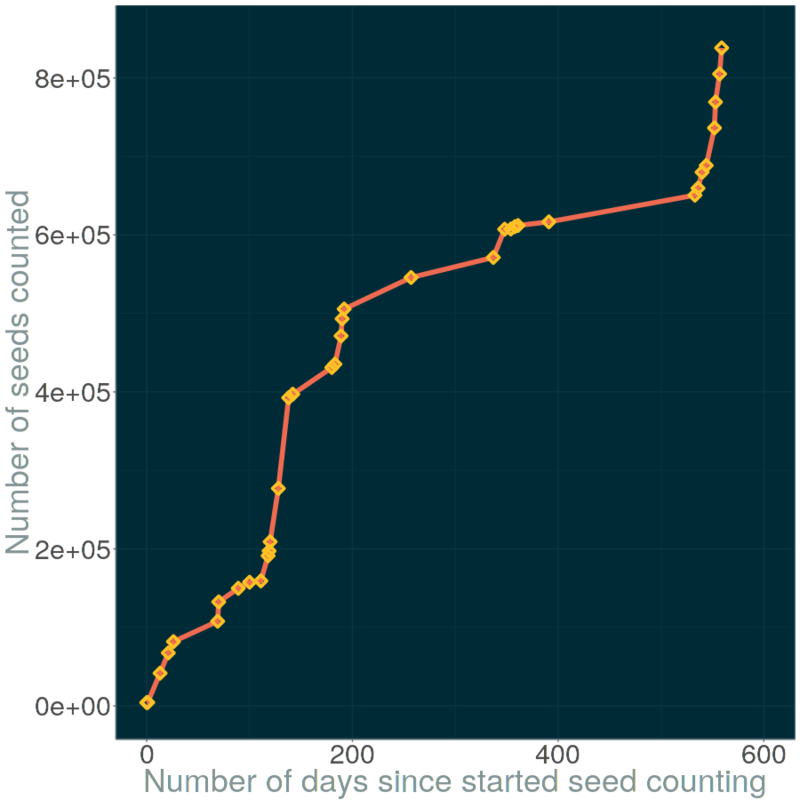 Seeds counted by research techs and myself over time. Current update: (838,184 seeds from 12,139 samples). Whenever someone shows me a cute pic of their pet... I bring up pics of my Finnegan... which range from hilarious to slightly scary.. and sometimes cute. 😊 Pics curteousy of my sister and her fiance, i.e. best kitty Auntie and Uncle ever, who are looking after my gremlin while I am in Australia. The bloodwood trees (Corymbia sp) around Brisbane are soo neat! That vivid red sap! Took the first afternoon of the Biological Sciences Postgrad Conference to wander around the tidal flats. Found some cool worms, crabs, and even a rose petal bubble snail!